Unless you knew, you would not even think to look. This substantial medieval church is lost in the woods, a good third of a mile from the nearest road, and the only way to get to it is to walk along a narrow track that runs along the side of fields and then through the woods themselves. When I first visited the church for this site about ten years ago, there were no signposts, and the church was locked without a keyholder. Today, things are much better. There is a sign listing the telephone numbers of three keyholders at the start of the track on the sliproad from the Bury to Haverhill road, and the track itself is marked by arrows attached to trees. 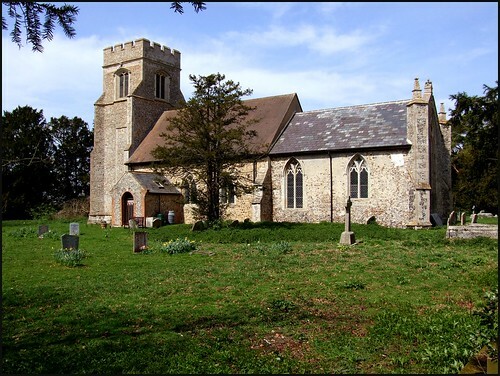 While a good number of Suffolk churches are separated from the nearest road by at least a field, only the route to Sotterley church involves a longer walk, and that is across open fields. Euston and Badley are also further from the nearest road, but you can drive to them. This makes Depden's one of the most romantic approaches of any church in East Anglia. The nice lady brought the key out to me at the start of the track, giving me instructions on how to return it to her, and so I set off beside the field, across a rickety bridge and through the woods. St Mary is so tree-surrounded that you don't actually see the church until you enter the graveyard from the north, when it reveals itself suddenly in all its glory. Apart from the tower, which will evidence dates to after 1451, this is a church that was substantially as it is now by the 14th century, and the windows of the nave and chancel may even date it to the previous century. On the night of 23rd of June 1984, this church was destroyed by fire. At that unhappy time for the Anglican diocese, when many churches were being declared redundant, it would have been very easy for the site to be abandoned, and St Mary to now be an ivy-shrouded ruin. However, the will of the community was that the church should be saved, and what a good job they made of it! The interior is full of light and simplicity, the modern chairs facing the clean, cool chancel with its collection of Continental glass. Some of them are roundels of Old Testament subjects: Shadrach, Meshach, and Abednego await their fate in one, while a sore-covered Job sits outside the city in another. The best of this is a pair of panels from a sequence of the Passion: we see Christ carrying his cross greeted by St Veronica in one, and in the other Christ is taken down from the cross and cradled in his mother's arms. But it is a little detail in the panels which makes them rather extraordinary: in both of them we see the man with the ladder, walking beside Jesus on the way to Calvary, and then walking away in the distance as the disciples mourn their Messiah, his day's work done. Two pairs of figure brasses to 16th century Jermyns are reset on the north wall, and there is a beautiful early 20th century Madonna and Child in a window at the south-west corner of the nave. The font is a curiosity, quite unlike any other I've seen in East Anglia, with scalloped panels containing shields. It probably dates from the 18th century. From half a millennium earlier, there is a lovely double piscina in the chancel. If a church survives a fire, and is rebuilt, it so often feels as though it has been recharged with a new energy, and that is certainly the sense you get here. The old south porch has been coverted into a kitchen facility with a clear glass door into the nave. This is open, and you can step through to see the Norman south doorway, like a reminder that you are, in fact, so far from civilisation. I think it is wonderful that this church has not been declared redundant, and that it is still in monthly use by the local Anglicans. They should be proud of themselves for what they have achieved here in the middle of the woods. It is often said that the Church of England ministers simply by existing, and that its medieval churches are its greatest act of witness. If that is so, then it is doubly true here.